Working through DCI, a national PR firm specializing in editorial placements, economic and prospect development, cultivate opportunities to change prevailing media perceptions regarding the Greater New Orleans 10-parish region and promote its assets to potential prospects. Conduct an editorial board review of major New York media in conjunction with business retention and attraction. MetroVision (the predecessor to Greater New Orleans, Inc.) had conducted previous leadership missions to large, metropolitan markets to promote the region but results and participation had been marginal. 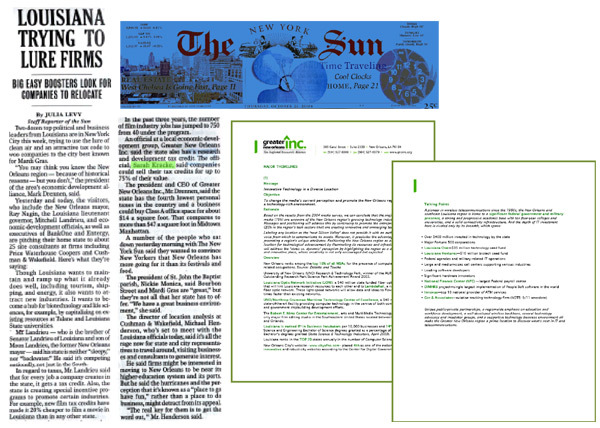 In 2004, all invited community leaders and elected officials traveled to New York, providing a dynamic opportunity to sell an important package of targeted messages. Direct DCI on overall media strategy and mission objectives. Provide strategic input on all phases of mission development including objectives, participation and itinerary. Develop all theme lines and messages. Participate in and lead executive media track with Secretary of Economic Development Mike Olivier, Lieutenant Governor Mitch Landrieu and Mayor Ray Nagin.